Bye, bye, Mr. Star Wars Song Parody Guy. 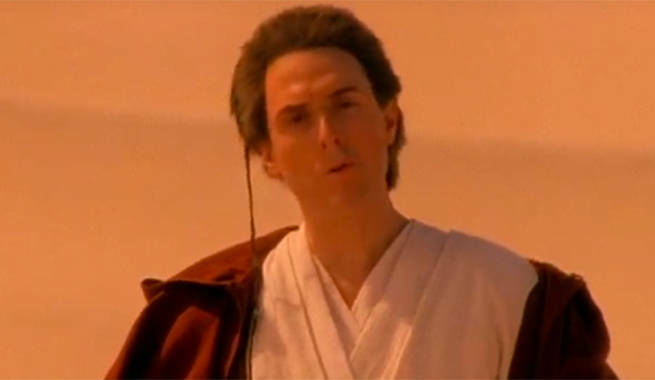 "Weird Al" Yankovic told Rolling Stone that he probably won't be adding to his Star Wars parody catalog any time soon. "It's a thought that crossed my mind, certainly," the humorous songmaker said of a new Star Wars song to coincide with the release of The Force Awakens in December 2015. "And everybody on my Twitter feed was like, 'Oh! You have to do another Star Wars song.'" Despite the demand and his tease from a couple of years ago, it was a non-starter for him in the end. "I looked at it practically. I've already got two Star Wars songs in my set, both of which I pretty much have to play because of fan demand. If I had a third Star Wars song, it just sort of becomes the Star Wars show. So for that reason alone, I kind of feel like I probably should just keep it at two." Those two songs, "The Saga Begins" (above) and "Yoda" (sung to "American Pie" and "Lola" respectively) are, as he said, a regular part of his sets, with Yoda as the ending number for "almost every show since 1980," the singer says - quite a feat, as he's played around 1,500 shows since then.